Autohaus Lake Norman is skilled at VW and Audi. Our ASE Certified technicians offer exceptional service with premium parts help keep your Volkswagen and Audi on the road longer for less. We take specialized training specifically on VW and Audi to make sure we stay current on technology & repair techniques which alleviates unnecessary repairs. We offer all aspects of repair, from scheduled maintenance & state inspections to advanced electrical diagnosis, engine repair and module coding & initialization. We are setup with Volkswagen & Audi factory diagnostics, called "ODIS". This allows us to do software updates on your vehicle, program keys and install components that are locked to a car via "component protection". Just another way we offer our customers complete dealer level service on their VW and Audi! Whether your VW or Audi needs tires, state inspection, routine service, brakes, advanced drivability or electrical diagnosis, Autohaus Lake Norman can handle your needs! Why does having "factory diagnostics" benefit you? Many repairs to your Audi vehicle require a software update, or can be remedied with just a software update. 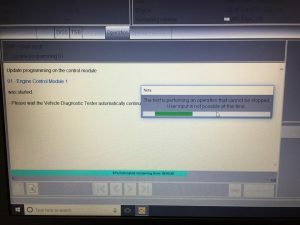 Very few shops outside of the dealer network can do these software updates, since they require a huge commitment from the Repair Facility and a direct connection to VW/Audi in Stuttgart. Because we went through the needed requirements, we can offer this service outside of the dealer network saving you time, money and stress! With factory diagnostics, we can pull up Service Bulletins, up to date Service Information, Program Keys and other Immobilizer components as well as Software Updates.